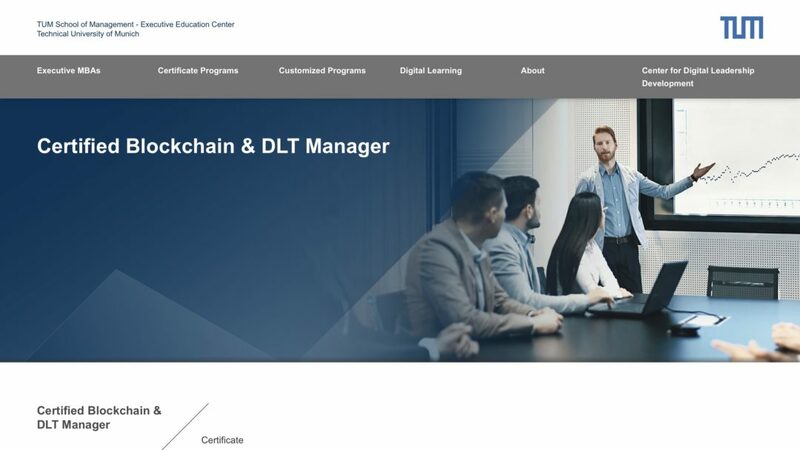 We are very happy to announce the brand new Certified Blockchain & DLT Manager program we co-developed with the TUM Executive Education Center and the European Blockchain Association. This program is aimed at professionals in corporations who want to achieve a clearer understanding of blockchains and other distributed ledger technologies in order to provide guidance in decentralized aspects of digitization within their companies. The Certified Blockchain & DLT Manager consists of a 5-day program, provided in 2 modules. In the first module, participants will discuss technical, economic, legal and regulatory aspects of blockchain technology. In the second module, corporate representatives present case studies that participants work on and provide new solutions for. The lecturers line-up of TUM experts with Prof. Dr. othersProf. Dr. Florian Matthes, Prof. Dr. Joachim Henkel, Prof. Dr. Jürgen Ernstberger, and Prof. Dr. Isabell Welpe on the one hand, and practitioners, such as Florian Huber of chain.de / Paradigm Ventures, Datarella CEO Michael Reuter, and other corporate representatives, looks promising. This combination of theoretical and practical contents facilitates perfect first steps into the decentralized aspects of corporate digitization processes. The program's first module starts on 18 September, 2019. The second module will follow right after the Oktoberfest - aka Wiesn - on 7-8 Octoberk 2019. All lectures will be held at TUM Executive Education Center in Munich. We are looking forward to this program and encourage IT-people as well as managers in corporations to participate!